I was at the book store with a friend the other day and we were looking at dvd’s and talking about Christmas when this women walked up and said, “I hate Christmas.” She went on to say “I mean I love the reason for Christmas, it’s just that every year around Christmas time something always goes wrong, it’s been like that for years. I tell everyone, watch, this year, something is bound to go wrong.” She then told me it never fails to happen. I tried to talk to her about the power of such statements and how with enough belief behind them you can actually create the event, but she was very set in her ways so I didn’t push the subject. I began thinking of statements I hear over and over from friends and family and guess what? 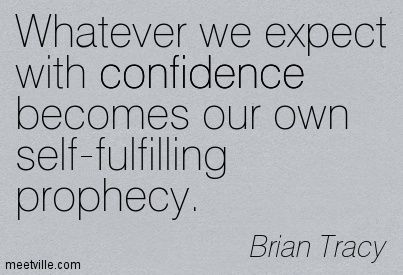 They are self-fulfilling prophesies. I could see them loud and clear, things like; “Every time I have money coming in some emergency always seems to come up and out the door it goes” And I have seen this happen so many times with them. I’ve also heard, “I’m going to lose my job to a younger worker I just know it.” and of course that is exactly what happened. What do you constantly talk about, dwell on, complain about, over and over? This becomes a type of mantra and with enough feeling behind it, like anger, fear, or worry, you’ll be sure to say, “see I told you so, I knew that would happen.” Don’t give yourself a self-fulfilling prophesy unless it’s one with a great outcome. Small Change #52 Do away with repetative negative statements. take a moment to think about and change what you seem to complain, talk, or worry about over and over and over. If you can’t come up with anything just ask one of your friends or family members, chances are they’ll have heard it time and time again.